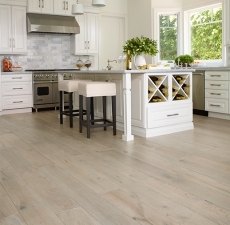 Gemwoods Hardwood floors is among the top providers of engineered hardwood floors, which never warp, expand, shrink or buckle due to weather and humidity factor! A leader in the industry, Gemwoods truly knows how to select, mill, refine and craft the natural resource of wood into some of the most luxuriant items you can ever install in your home. Truly as precious as any gemstone, these planks elevate flooring into a high art form that is as functional as it is beautiful! When you love the Traditional style of real hardwood, nothing compares to the Gemwoods Estate Collection, a series of gorgeous, timeless, wire-brushed hardwood flooring. This beautiful flooring comes complete with hand distressed edges and ends using upwards of 36 old world artisan hand-distressing tools and techniques. A leader in the industry, Gemwoods truly knows how to select, mill, refine and craft the natural resource of wood into artful planks you can bring to your home or office. Durability is not just a promise, it's a fact. 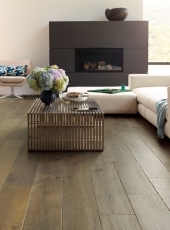 These planks never warp, expand, shrink or buckle due to weather and humidity factors. True Americana engineered from fine Walnut, Hickory, and Maple, the Gemwoods Estate Collection showcases 14 distinctive and rich color selections so you can find the perfect wood species and tone to match your life, or the life you wish you had. 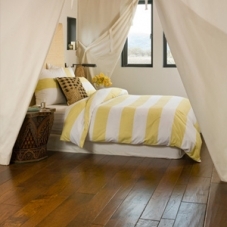 Fill a room with the warmth of real hardwood, or fill your entire home. Go throughout with just one wood and color, or mix it up from room to room so you can really enjoy the different ambiance each space gives you. From rustic to French Country, traditional to Southwestern and more. Your Gemwoods Estate Collection flooring will be the heart of your home, so make it your room's centerpiece and surround it with furniture and textiles you love. Just don't start in the bedroom because you may never want to leave. Either way, you may never want to leave the creature comforts of your space again no matter where you begin your DIY hardwood journey. The variety of finishes, widths and stains to choose from reflects Gemwoods’ passion for and vision of what hardwood flooring can do for any interior - whether it‘s just one room, or a seamless flow throughout your entire home. Your options are virtuously limitless! Below are the six Gemwoods Hardwoods Collections from which you will find the perfect reflection of your personal style. 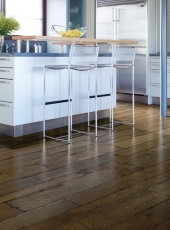 Acacia engineered hardwood flooring features a characteristic marled wood grain, with beautifully contrasting bright and dark tones within each plank. The California Classics Collection has a tasteful beauty that will outlast every Hollywood trend a billion times over! 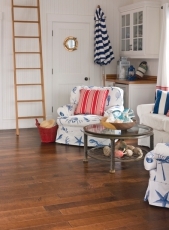 The Pacific Treasures collection is hand scraped for a rustic look that makes you feel as if you are only steps from the sand dunes outside of your own beach bungalow! The Reserve Collection has a timeless, refined and natural look that is a perfect way to invest in your home’s value for decades to come. Smooth Sailing Collection has seven distinct looks that all evoke a life of seafaring adventures, even if you are a landlubber and get sea sick taking a bath. 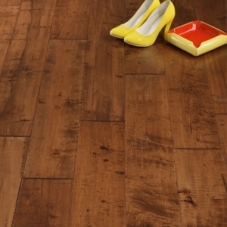 Lastly, the Southwest Collection features an assortment of robust and handsome 5” wide hand scraped planks that bring a piece of Americana right into your home!